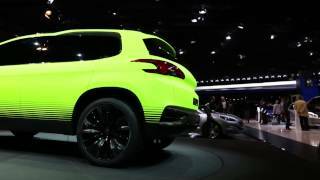 Peugeot unveiled the 'Urban Crossover Concept' at Beijing Auto Show earlier this year. 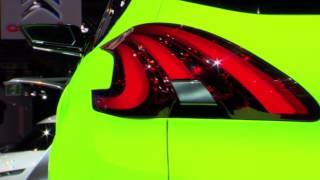 Now, its time for another concept at the Paris Auto Show. 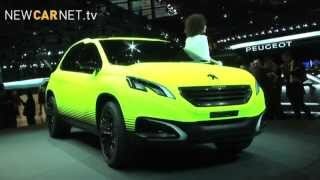 Peugeot 2008 Concept is one of those concepts that make it to the assembly line and reach out to consumer market. The engineers and stylists have worked together in Europe, China and Latin America to create this seductive future vehicle of the range. It is painted fluorescent yellow with Velvet matt varnish, a very luminous colour which is full of energy. With its athletic and sleek lines it imposes its bold posture which overturns and reinvents the standards of the larger vehicles in the small-vehicles segment. The 2008 Concept also has very sensuous and sophisticated sculpted wings and sides, indicating natural athletic qualities. The large wheels, the design of their wheel arches and the ground clearance symbolise an active life without restraint; agile, versatile and lightweight. Forging ahead with a competitive position in the B segment, Peugeot has extended its traditional position with a new, broader, all-encompassing approach. So, the 208 was designed in accordance with an ambitious specification to re-generate the small hatchback. It went on sale in Europe at the end of March 2012, and in the UK at the end of June, prior to an industrial and commercial launch in Latin America in 2013. With more than 15 million ‘2’ series vehicles, Peugeot benefits from a credible history in thedomain of compact cars. This is further reinforced by the new 208, which has re-generated the codes of the segment. 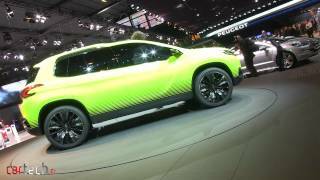 Recently, the marque has acquired legitimacy in the domain of the Crossover, with the commercial success of the 3008 and the inspiration drawn from the SXC Concept Car shown at the Shanghai Motor Show in 2011. The 2008 Concept naturally bears the stylistic codes of the Marque. With its athletic and sleek lines it imposes its bold posture which overturns and reinvents the standards of the larger vehicles in the small-vehicles segment.